Parking: Please park at the Park & Ride located just to the west of the Brown Deer Road exit of I-43. A free shuttle bus will run between the Park & Ride and Lynden beginning at 10 am. If you require handicap access, you may park in the lot at Lynden. Lynden opens its doors to the community for a Family Free Day featuring the artists participating in Call & Response. Expect a day of activities and performances, and an extended opportunity to join Arianne King Comer around the dye vat. This is a Call & Response event. The Falafel Guys food truck will be on hand from 11:30 am-2 pm, serving falafel, shawarma, and more. 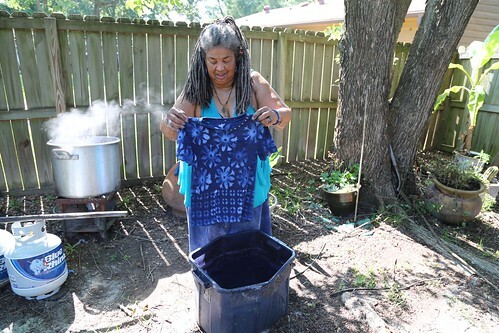 Arianne King Comer leads a day of communal resist-dyeing. Focusing on shibori (Japanese) and adire (Yoruba) methods, Comer will preside over the dye vats, inviting visitors to collect interesting found objects on the grounds to create resist patterns when they dip. Bring your 100% cotton or silk clothes, tablecloths or napkins and trans form them into wearable and functional art. If you are bringing new items, be sure to wash them beforehand. We will have a small supply of garments on hand for those who need them. Cool off inside the house where we will be showing a selection of videos about the indigo process in different places around the world. Make your own button from start to finish to put on your favorite jacket, backpack, or fanny pack. Choose from a variety of materials to create your own design, then turn it into a wearable button. Artist, author and activist Jenna Knapp is the creator of The Self Care Studio, an online and IRL platform for illuminating the practice of self-care techniques, to make your own button. For a complete list of Self Care Sundays at Lynden, click here. Join Lynden's director of education Jeremy Stepien and MPS intern Alexis Antemate to work on art projects. In the morning, they'll be making zip-line sculptures. In the afternoon, wind wisps of fiber into Felt Marbles. Lynden naturalist Naomi Cobb will be at the pollinator garden celebrating all things butterfly related: she'll have Monarchs to observer, butterfly gliders to decorate and fly, plus mini bird kites. Artist Gary John Gresl continues his residency at Lynden with an assemblage created for Family Free Day. For more on his residency, The Body Farm at Lynden, click here. Instructor Heather Eiden offers a free session of Art and Asanas, her 5-session Yoga in the Garden class at Lynden. In this beginning/intermediate Hatha yoga class, Eiden focuses on mindfulness, centering, and alignment in relation to Lynden’s collection of monumental sculptures as she leads students through asanas (physical postures), pranayama (control of the breath), and relaxation. Eiden calls upon her background as a ceramic artist and art educator to teach slow looking, the act of looking deeply at a work of art. For more information on Yoga in the Garden, click here. Nickel & Rose (Carl Nickel and Johanna Rose) play songs from their two EPs, Oh Sweet Love and Americana, as well as unreleased original material and traditional covers, on the porch of Eliza’s Peculiar Cabinet of Curiosities. On the face of it, the songs of Nickel & Rose could be seen as a blend of folk and Americana, but that doesn’t come close to describing their sound. Their music is the bridge upon which their many and varied influences meet. 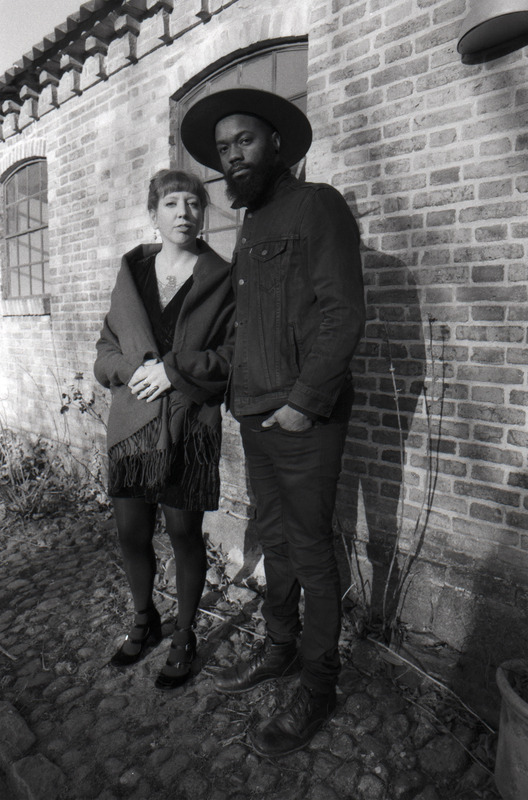 Just as Carl Nichols and Johanna Rose’s harmonies entwine their distinctive voices, the duo’s music is similarly a melting-pot of unique styles. Carl was raised on Milwaukee’s north side on a diet of gospel music and the sounds of Senegal, Mali, and Guinea, whereas Johanna was born in the east side, spending her youth in punk basement shows in the Riverwest neighborhood. A list of the artists that inspire them ranges from Taj Mahal to Django Reinhardt, from Ali Farka Touré to Lucinda Williams. Throw in other ingredients such as the works of Aldous Huxley and the films of Alejandro Jodorowsky and you start to get a sense of Nickel & Rose. There’s also the experience gained from touring across large portions of Europe, in Denmark, France, the Netherlands, and the Czech Republic, to name just a few. It’s in this part of the world where they hitched a ride from a group of smugglers in order to cross the Ukrainian border and where they played to 50,000 anti-corruption protesters in the Romanian town of Cluj-Napoca. All of which leads us to the new Nickel & Rose EP, Americana. The five courageous tracks explore the duo’s fractious relationship with the genre. On the one hand the inventive melodies and rustic charm pay homage to the Americana tradition but at the same time the themes look at what it means to be a diverse artist in the United States today. The follow-up to last year’sOh Sweet Love EP, Americana is their most personal release to date. Though recorded in two studios over the course of six months, the songs originally came together in their attic home, which doubles as a practice and recording space that they share with Johanna’s pet snake, Dreamboat. It was while writing this music that they began to question whether or not they belong in the genre they love. What can’t be questioned though is their passion for roots music, their ability to bring all of their influences together in one intoxicating brew, and the timeless quality of the songs they make together. They’ll leave the classifications up to you.